This morning I had the idea to celebrate the popularity of Google+ amongst my Japanese and non-Japanese friends here in Tokyo by running the Google+ logo. It was only supposed to be about 13km, but in the end came in at over 21KM – and that’s without the connecting sections that I didn’t track. In total it was probably about 24KM. Planning the route with Google Maps beforehand took about 90 minutes – it was tricky to get everything in proportion given the road layout. 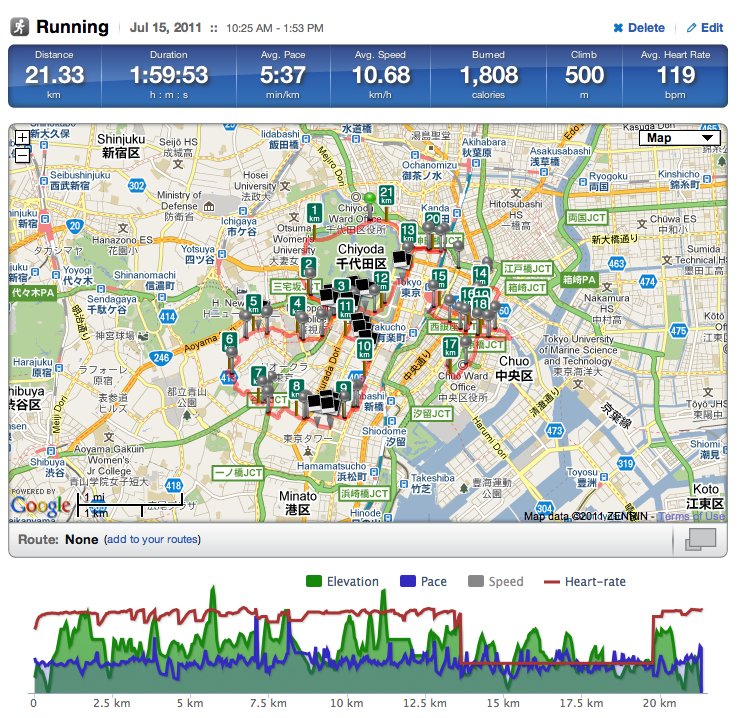 As usual I used runkeeper to track the run – and Google Earth on a second iPhone to see which way to go next. Unfortunately I accidentally picked up an iPhone 3G instead of a 3GS – it was sooooo slow, and in fact in the end the GPS packed up altogether (possibly due to the fact that it was connected to a mobile router that has a habit of getting its coordinates in a twist). The temperature steadily rose, hitting about 32 degrees as I made my way over to make the plus. I spent much of my time at that point running with an ice cream in hand! See all the stats and detailed map here. lol, but where is the +1 button? Gah! I’ll have to go out and run it again now! This is so cool. I ♥ G+ & Hangout. G+ has allowed me to have many meaningful engagement with people that I have never met in real life. I am happy to “meet” you here. P.S. 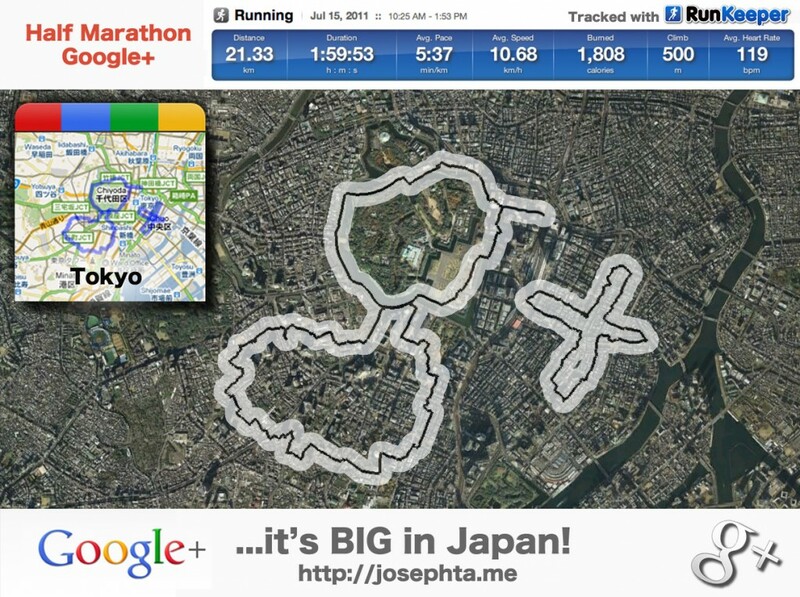 I wish I am fit enough to run such a spectacular run in Calgary, Canada. Mind you, if I can get 20 people and the hardware to run together, I bet I can run one of the segment.